The first adjustable airflow clearomizer from Innokin. This 1.4ml clearomizer tank features a bottom dual coil design with replaceable heads, a pyrex-glass tank, and adjustable air flow ring to get your perfect vape. All parts can fully disassembled allowing easy cleaning and maintenance. A truly great new innovation from Innokin. The Gladius clearomizer tank features a “bomb proof” pyrex glass tank, 1.4ml capacity, bottom dual coil replaceable heads and an adjustable air flow ring to set the level of draw when you inhale. This exceptionally high quality design and construction allows each component to be taken apart for easy maintenance and cleaning. 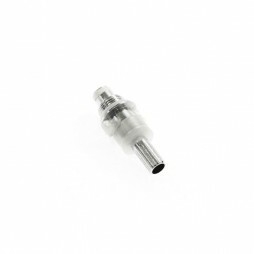 The Gladius clearomizer also features a interchangeable drip tip to allow further customization and provides amazing vapour production and flavour from the start. Each Gladius clearomizer tank comes in a acrylic presentation box with 3 Gladius clearomizer heads (1 pre installed, 2 spares) and is available in 1.5omh and 2.1ohm resistances. 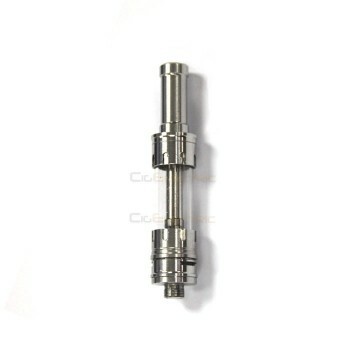 Hold the Gladius clearomizer with the 510 connection facing up. Unscrew the cap just below the adjustable airflow ring. Fill tank against the inner wall avoiding the center hole. Replace and carefully tighten the tank until firmly in place. Allow several minutes for the wicks to soak up liquid on the first filling. Replacement heads can be purchased here.